L'ISOLA DEI CANI - V.O.S. 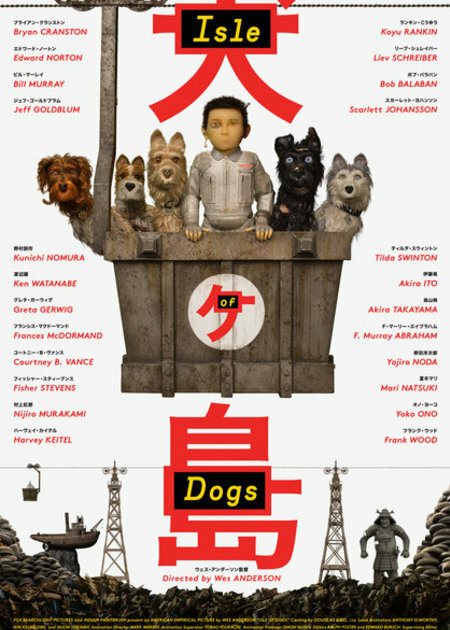 Trama: Isle of Dogs (犬ヶ島 Inugashima) is a 2018 stop-motion animated comedy film written, produced and directed by Wes Anderson. Set in a dystopian near-future Japan, the film follows a young boy who goes in search of his dog after the whole species is banished to an island due to an illness outbreak. The film's ensemble voice cast includes Bryan Cranston, Edward Norton, Bill Murray, Jeff Goldblum, Greta Gerwig, Frances McDormand, Courtney B. Vance, Fisher Stevens, Harvey Keitel, Liev Schreiber, Bob Balaban, Scarlett Johansson, Tilda Swinton, F. Murray Abraham, Frank Wood, Kunichi Nomura and Yoko Ono.